HIPAVE is the leading tool for the design of heavy duty industrial pavements such as container terminals. 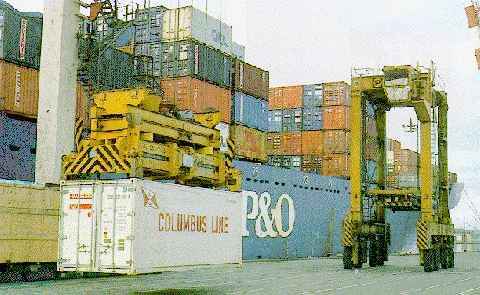 Container handling vehicles can have tyre loads comparable to those resulting from very large aircraft. Allan Bowman and Associates Pty Ltd was commissioned by Kinhill Cameron McNamara Pty Ltd in February 1996 to undertake pavement design for a proposed new industrial hardstand at a Port of Brisbane container terminal in Queensland. The designs included asphalt surfaced and interlocking concrete block pavement alternatives for the 45,000 m2 container terminal hardstand to cater for heavy container handling equipment with axle loads of up to 70 tonnes. The pavements are to form hardstand for 20 ft and 40 ft containers. 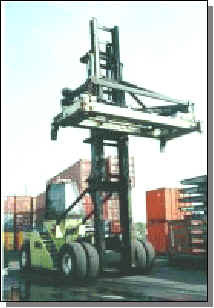 They will be trafficked by large forklifts and reach-stackers carrying containers between the hardstand and the wharf, and highway trucks used to transport containers by road. Mechanistic analysis and design was facilitated with APSDS (a forerunner of HIPAVE), allowing calculation of the effects of some 11 axle load scenarios for the 3 vehicle types. The pavement designs provided for the accumulated damage of over 3 million total axle passes, and included reductions in pavement thickness to allow for vehicle wander over a transverse tracking distance of 8 metres. APSDS (a forerunner of HIPAVE) has recently been used on container handling projects for the Ashdod North Port Development in Israel, Port of Brisbane Corporation (Australia) and CTX Corporation (Florida). You are welcome to download and evaluate HIPAVE. There is only one version of HIPAVE - and it can be used in evaluation mode. Click here to download HIPAVE.